The earliest solar eclipse recorded by the ancient Greeks occurred. Halley's Comet passed perihelion in its seventh known passage, as determined from records by Chinese astronomers. On 19 April 607, Comet 1P/607 H1 (Halley) approached within 0.0898 AUs (13.4 million km, 8.35 million miles) of Earth. On 16 October 1982, astronomers David Jewitt and G. Edward Danielson using a CCD camera with the 5.1 m Hale telescope at Mt. Palomar Observatory were the first to detect Halley's Comet on its thirtieth recorded return. J. Chacornac discovered asteroid #25 Phocaea. J. Chacornac discovered asteroid #34 Circe. Prosper Henry discovered asteroid #186 Celuta. J. Palisa discovered asteroid #309 Fraternitas. P. Gotz discovered asteroid #563 Suleika. J. H. Metcalf discovered asteroid #755 Quintilla. The American Radio Relay League (an organization for hams - amateur radio operators) was founded. S. Belyavskij discovered asteroid #857 Glasenappia. B. Jekhovsky discovered asteroid #977 Philippa. Four US Army Air Corps planes left Seattle on what would become the first successful around-the-world flight when two of them returned 175 days later, on September 28. Polytetrafluoroethylene resin (Teflon) was discovered by Roy J. Plunkett at EI Du Pont de Nemours & Company. K. Reinmuth discovered asteroid #2249 Yamamoto. USSR's Sputnik 3 re-entered the atmosphere. USSR launched Cosmos 2, the second satellite in the Soviet Earth Satellite series, which employed radio methods to study the structure of the ionosphere. Intelsat 1 ("Early Bird") was launched, the first commercial geosynchronous communication satellite. T. Smirnova discovered asteroid #1804 Chebotarev. NASA launched ATS 2, but the satellite failed to reach its intended orbit. However, useful (although limited) data were returned from the orbit it did achieve. ATS 2 (Applications Technology Satellite) was a medium altitude, gravity gradient stabilized spacecraft designed to (1) test new concepts in spacecraft design, propulsion, and stabilization, (2) take high quality cloudcover pictures, (3) provide in situ measurements of the aerospace environment, and (4) test improved communication systems. The cylindrically shaped spacecraft was 56 inches (142 cm) in diameter and 72 inches (183 cm) long. Its structure consisted primarily of a corrugated thrust tube with honeycombed bulkheads secured to each end. Equipment components and payload were externally mounted on the outer surface of the thrust tube as well as on a structure that slid into the interior of the thrust tube. Electric power was provided by two solar arrays mounted on either end of the spacecraft's outer shell and by two rechargeable nickel-cadmium batteries. Extending radially outward from the side of the spacecraft were four 92.5 foot (28.2 m) adjustable gravity gradient booms. The spacecraft telemetry system consisted of four 2.1 W transmitters (two at 136.47 MHz and two at 137.35 MHz), and a microwave communications experiment. During its launch on 6 April 1967, the booster's second stage failed to ignite, resulting in an unplanned elliptical orbit. Stresses caused by this orbit eventually induced spacecraft tumbling. In spite of these conditions, useful data were obtained from some of the experiments, most notably the cosmic ray and particle experiments, and the field detection experiments. The satellite reentered the atmosphere on 2 September 1969. 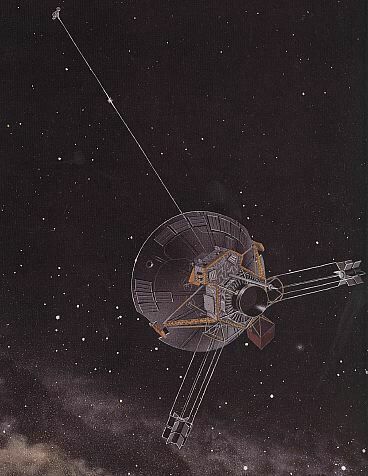 NASA launched Pioneer 11 to Jupiter and Saturn, and subsequently into interstellar space. NASA launched STS 41-C (Challenger 5, 11th Shuttle mission) to deploy the Long Duration Exposure Facility (LDEF) satellite. During the flight, the first on-orbit spacecraft repair was completed (Solar Maximum satellite). STS 41-C was launched into the first direct ascent trajectory for the Space Shuttle on 6 April 1984 after a countdown that proceeded without delays. Using manned maneuvering units, the astronauts replaced the altitude control system and coronagraph/polarimeter electronics box in the Solar Maximum satellite while it remained in orbit on 10 April 1984. The Long Duration Exposure Facility (LDEF) was deployed, carrying 57 experiments and left on orbit with intention of retrieving it during a later mission. Other payloads carried on STS 41-C were: the IMAX camera; Radiation Monitoring Equipment (RME); Cinema 360; and the Shuttle Student Involvement Program (SSIP) experiment. STS 41-C ended 13 April 1984 when Challenger landed on revolution 108 on Runway 17, Edwards Air Force Base, California. Rollout distance: 8,716 feet. Rollout time: 49 seconds. Launch weight: 254,254 pounds. Landing weight: 196,975 pounds. Orbit altitude: 313 nautical miles. Orbit inclination: 28.5 degrees. Mission duration: six days, 23 hours, 40 minutes, seven seconds. Miles traveled: 2.9 million. The mission was extended one day when astronauts were initially unable to grapple the Solar Maximum Mission spacecraft. The originally planned landing at KSC was scrubbed, and the mission was extended one revolution to facilitate landing at Edwards. The orbiter was returned to Kennedy Space Center 18 April 1984. The flight crew for STS 41-C was: Robert L. Crippen, Commander; Francis R. Scobee, Pilot; George D. Nelson, Mission Specialist; James D. A. van Hoften, Mission Specialist; Terry J. Hart, Mission Specialist. This date marked the first time 11 people were simultaneously in space, 6 cosmonauts on the USSR Salyut 7 space station, 5 on NASA's Shuttle Challenger. Isaac Asimov (2 January 1920 - 6 April 1992) was a Russian-born United States author and biochemist, a highly successful and exceptionally prolific writer best known for his works of science fiction and for his science books for the lay person. He also wrote mysteries (many of which were collected in the Black Widowers books) and fantasy, and has works in every major category of the Dewey Decimal System except Philosophy. He wrote or edited over 500 volumes, and an estimated 90,000 letters or postcards. Asimov was a long-time member of Mensa, albeit reluctantly (he described them as "intellectually combative"). The asteroid 5020 Asimov is named in his honor, as is Honda's humanoid prototype robot ASIMO. USSR launched Progress M-34 carrying 2,430 kg of cargo to the Mir space station.